Other Ingredients: Cellulose Gel, Croscarmellose Sodium, Silica Gel, Hydroxypropyl Methylcellulose, Magnesium Stearate, Polyethylene Glycol, Carnauba Wax. †† This Statement Has Not Been Evaluated By The Food And Drug Administration. This Product Is Not Intended To Diagnose, Treat, Cure Or Prevent Any Disease. 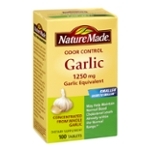 Amount Per Tablet: Concentrated Garlic Bulb - 500mg*†. † 1,250 Mg Garlic Bulb Equivalent.